It has been a few months since you've had a tasty morsel of an update from the world of my Goat Island Skiff, and this almost mid-winter update will focus on the damage incurred over the past 30 day (or so) season last year, and what needs to be fixed. I took many of these pictures last fall for this post specifically, but decided to hold off posting until I got into a mood. Today, while perusing some photos, I got in that mood. 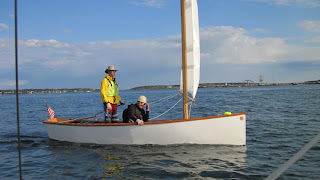 To recap: Last fall I needed to pull the plug on sailing, and I did that at Clint Chase's messabout. There were a few more good days of sailing that season in early November, but the water was cold, and I had to draw the line somewhere. Additionally, I wanted a warm day to wash the boat so I didn't have to do it in freezing temperatures, so when that day swung through with heavy fog, I took advantage of the opportunity and washed and stored my GIS. As you can see in these following photographs, the hull fared quite well over the past season with minimal damage to her underside. The intrepid reader will remember that she is not glassed out or in, only some tape along the chines. I added a bow skid (not in plans) to take the brunt of grounding her on rocky New England coasts, and I'm glad I did. In retrospect, I should have laid down some fiberglass cloth for abrasion/puncture resistance and skipped the bow skid, because rocks still punched through the ply-- indicated by the little spots speckled around the bow. Those are not dirt marks, the hull has been washed, those are holes that punched through the outer veneers of the plywood and were quickly patched with epoxy during my busy season. There are also many scrapes along the chines, which take a good beating. Heavy fiberglass tape is essential here if you plan on adventure cruising your Goat Island Skiff along rocky shores. Interestingly enough, the stern, even though it was repeatedly dragged around miscellaneous beaches, suffered almost no ill, it is shiny and smooth and in wonderfully good shape. The daggerboard trunk took some hits with the daggerboard, everytime I hit something the board would slam against the aft end of the slot, and the plywood really got beaten up here. I kept adding epoxy as the season went on to keep it sealed. This winter I would like to add a heavy rubber or foam strip to cushion the board from doing such damage to the boat. Apologies about the focus. If you look carefully, it's that thin black crack that extends up from the corner. I have no idea how that occurred, but my hunch is when I collided with rocks in the middle of the night in Casco Bay during the VisionQuest/ManQuest 2010. My shipmate Jason detailed the accident here. I was tossed over the center thwart, and my shin hit the bulkhead pretty hard during the collision-- so that is my hypothesis. The floor of the boat has multiple dark stains throughout where objects were dropped and bailing buckets were scraped-- Storer does not recommend fiberglassing the interior of the boat either, but even with three coats of epoxy and 5 coats of varnish, I still was able to wear or puncture down to the plywood in multiple areas, which introduced water and stained the Okoume. Notice the dark spot to the left of the yogurt container (dropped the anchor) and the multiple scrapes next to the chinelog in front of the sail (scraping from the bailer). This is just an example, almost all quadrants of the floor exhibit these marks from wear and tear. Unfortunately, I have non-skid down and sanding this down to get a good nice epoxy layer to cover this will be difficult. Otherwise, things came through in decent shape over the season. There is definite wear on all surfaces that rub, such as the inside of the daggerboard trunk, the mast partner and step, the inside of the rudder stock, bulkhead arms, gunwales, etc., but nothing that a touch of epoxy and varnish won't take care of. The last item is the daggerboard itself, which took multiple hard hits over the season, and the trailing edge took a beating. I had filled some of the beatings with thickened epoxy, but these end up harder than the wood around the filling, and when the trailing edge is smacked against the daggerboard case, it wipes out even larger areas of wood. The crunch on the right was filled like the one on the left, but another grounding wreaked considerable havoc on the edge as you can see-- bummer. This clearly shows what I'm talking about. It's actually quite minor, and barely noticeable unless the sun is at a low angle, and it doesn't affect performance, but it bugs me to no end! ARGH I hate it! So it must go. Some sanding, some epoxy, some Quick Fair, and I hope it's good to go. It was a pretty fall, and now it's winter. I'm going for a schuss! this is a great post! very useful for those of us thinking about building one. thanks! Adam- Thanks for the comment! Clint- I used Cherry (it was available) for my spacers in the trunk, and I'm glad I have a hardwood in there. The daggerboard itself has a Cherry leading and trailing edge as well, but even that got bashed up. A nice touch on the boat would be to ensure that the trailing edge of the daggerboard case would be to make sure that the plywood is angled to match the angle of the aft spacer, that way you won't get a lip that will compound the board hitting it. A great story so far! Zinia has some scars from a season of heavy use, which is to be expected given the shores and hazards you've encountered! The great thing with wooden boats is they are repairable and can be brought back to great condition relatively easily. We are so lucky here (Hunter Valley, Australia) because our winters are nothing like yours. While most people pack their boats away and do maintenance over the winter, sailing is quite possible if you wear the right gear. Temps very rarely fall below zero, and only at night anyway. Bruce, it was -24 degC here for several nights in a row! No sailing, for sure, I can't even repair the boat in the garage, the epoxy will never kick off!